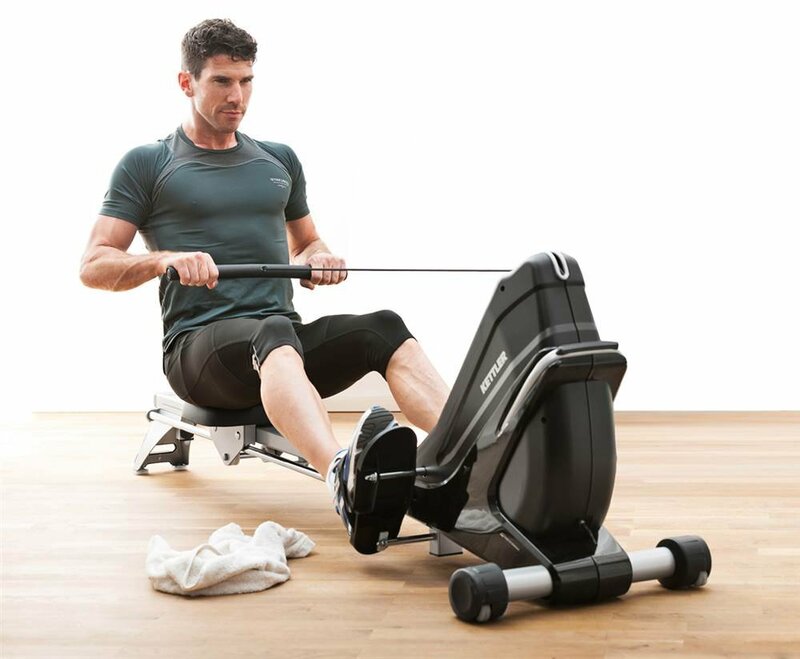 The Kettler Coach E Indoor Rowing Machine is a high-quality fitness machine that is designed to simulate the action of rowing in a watercraft. A machine that was released only a few years ago, this rower helps an individual achieve their cardiovascular exercise goals and train more efficiently for rowing. This model comes equipped with a durable carbon steel frame, easy four-step assembly, adjustable straps allowing for a full longitudinal rowing motion range and vast resistance that ranges from 25 to 500 watts. It also contains state of the art computer technology, since it has 12 programs available on its high-resolution LCD display and a computer calibrated ergometer for maximum precision.This rower made it to one of our top picks of the best rowing machine for this year. This German rower is built with quality and care in mind. The machine is durable and should last for many years. The power coated steel frame can hold up to 285 pounds, which should accommodate most users looking to purchase the product. Better still, the Kettler Coach E’s frame comes backed with a lifetime warranty that ensures peace of mind for the buyer. The rower comes with a full suite of 12 workout programs in total that ensure the rower can meet any and all fitness needs. There are also two heart rate programs that will automatically adust the rower’s resistance based on the user’s target heart rate while exercising. Most importantly, the actual rowing experience itself is a pleasant one! The machine has a thickly padded seat, quality rollers that allow for efficient gliding motions and the foot design pivots in a biomechanically correct way that allows for an accurate range of motion and complete rowing experience. Also, the Kettler is engineered well in terms of its sound output. The machine is very quiet and will not be a noisy nuisance in a family home. At the $1399.99 price currently on offer via Amazon at the time of writing, this machine is also a great value to boot. The LCD display on this rowing machine lacks a backlight. This makes the unit difficult to read at times if the rower is in a room with subpar lighting conditions. The seat is also a bit too low than it should be ideally. For some individuals, it might be difficult to get on and off of the unit. Still, this is largely a non-issue. Once an individual is securely in place on the unit he or she would not have any issues with comfort while exercising. It is not the most aesthetically pleasing machine. There are other rowers on the market that have a more elegant or stylish look. While the Kettler Coach E is not all positives, the machine might be too great of a value to pass up. It may not be the most stylish machine, but a good rower should be all about performance and function. This machine nails those two critical areas. Further, most consumers won’t exercise in a dark room, so the lack of a backlight is not a significant issue. The only potential issue with the unit is the low seat. However, for the overwhelming majority, it will not pose a problem. All things considered this unit could not come recommended more highly. With its excellent build quality, vast array of programs, wide ranges of resistance, sturdy frame and lifetime warranty, this unit is an absolute steal at its listed price. The fact that it is currently on sale on Amazon for about $340 less than its list price makes this rower an easy choice to give my highest recommendation.